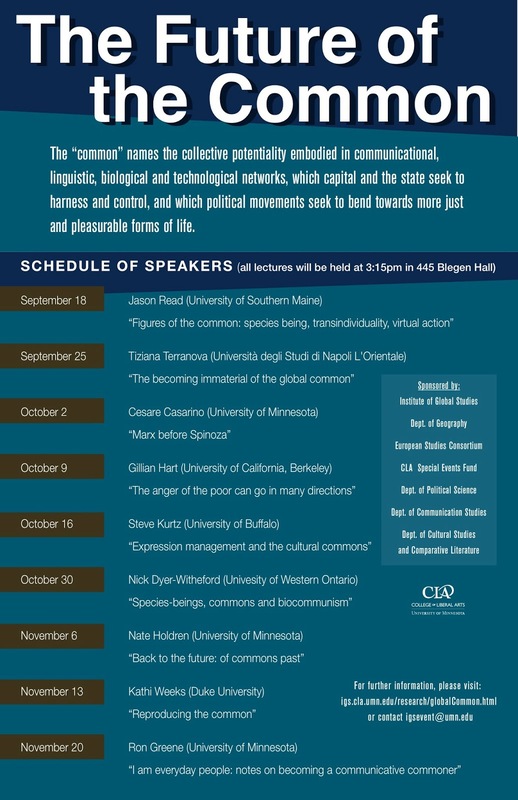 Paper was originally presented at the Futures of the Common conference at the University of Minnesota in 2009. Some of this has been taken up into my current work, and some of it has been abandoned. I am posting it here for the gnawing criticism of digital mice. The common has become a central term for political action and philosophical reflection. At first glance this would seem paradoxical; after all, Marx argued that capitalism confronts us as immense accumulation of commodities, as a situation in which all that exists, exists as a commodity, as private property. The attention to the common would then seem to be the worst sort of nostalgia, a lost Eden before the fall of primitive accumulation. Proponents of the concept, however, argue that the term does not just shed light on the origins of the capitalism, on the destruction of the agrarian commons that constituted the necessary condition for the emergence of labor power, but reveals its current function, as capital appropriates not just the commons in terms of land and resources, but the common, understood as the collectively produced and circulated knowledges, habits, affects, and concepts that produce our cultural life. It is worth noting, however, that this distinction between past and present, material commons and the immaterial common, is not that rigid. It might be argued that part of the appeal of the very term the common, as a strategy for political organizing, is that it bridges together disparate areas of struggle under one concept; it makes it possible to unify in one concept struggles over the most basic material necessities, such as the ownership of water and seed stocks, with the contested terrain of the ownership of digital commodities, images, and language itself. It thus unifies in a way that work or the inalienable rights of man are no longer able to, outlining new antagonisms and new lines of alliance. The turn to the common is thus paired with an investigation of the ways in which commons, or the common, are privatized, enclosed: the revival of the term common is often coupled with a revival of the debates over “primitive accumulation” as a process of dispossession. The common unifies all these disparate aspects, making it possible to imagine a political subject, a multitude that would include, but not necessarily unify, farmers struggling over access to water and battles over the ownership and control of the codes and protocols of digital information. Thus, as a philosophical problem, the common destabilizes two of the defining dualisms of western thought, the division between the individual and society, and that which separates the relation between things and the relation of people. Or, put otherwise, to understand what is at stake in the common it is necessary to understand the way in which subjects, or individuals, are constituted through social relations and vice versa, and the way in which this “relation of relations” is inseparable from its inscription in objects, in technologies, machines, and bodies. These philosophical oppositions must be overcome in a conceptual labor, not just dispensed with by declaration. This is something that I plan to demonstrate, rather than just assume, in what follows, as I examine three different figures, or, really, concepts of the common, or the problems of the common as they have been articulated here. These are species being (or Gattungswesen) in Marx’s critique of capital; transindividuality, a concept developed by Gilbert Simondon, and employed by Paolo Virno and Bernard Stiegler; and last Gabriel Tarde’s notion of mental cooperation, developed by Maurizio Lazzarato into a concept of noopolitics. In addressing each concept or figure, my goal is to show how its particular ontology casts light on the concept of the common while simultaneously utilizing the political and social exigencies of the common to cast light on the concept in question. The goal is not simply to draw out the merits and limits of each concept, but to continually interrogate ontological concepts by means of social relations, while simultaneously using ontology to open new ways of conceptualizing social relations. In the Grundrisse Marx writes, “The human being is in the most literal sense a political animal, not merely a gregarious animal, but an animal which can individuate itself only in the midst of society.” This statement, like many of Marx’s general philosophical statements outlining his ontology and, in this case, his anthropology, is stated in the form of a polemic. In this instance the polemic in question is aimed at the “Robinsonades” of political economy that take the isolated individual as their starting point. The central polemical statement is thus that the individual can only be a product of history not its presupposition. Which is to say that for Marx the idea of an abstract individual, not defined by place or location in the social structure is itself a product of history, most importantly the history of capitalism, in which relations of personal dependence give way to rule by abstractions. Underlying this polemical point is a series of philosophical points that are as crucial to any understanding of the common as they are limited in their articulation. First, there is the idea that the human being is an animal that can “individuate itself only in the midst of society,” that individuation takes place through society, through social relations. This directly contradicts a longstanding liberal ideal, fuelled by a cold war imaginary, in which one is an individual prior to, or a part from society. Society can then only repress or limit the individual: it is a nightmare in which all jumpsuits are grey. From this first premise there follows a necessary, albeit paradoxical, consequence: that the isolated individual, the individual that would see herself independent of society, has to be seen as a particular mode of socialization. As Marx writes in the same passage, “Only in the eighteenth century, in 'civil society', do the various forms of social connectedness confront the individual as a mere means towards his private purposes, as external necessity. But the epoch which produces this standpoint, that of the isolated individual, is also precisely that of the hitherto most developed social (from this standpoint, general) relations.” These relations include most importantly the separation of the workers from the means of production, which in turn isolates the workers from each other, from anything like the totality and their role within it. Thus we could say that there is a relationship between the commodity, or even the commodity fetish, and the isolated individual. In each case the productive process, the social relations, are effaced in what they produce. Just as the commodity appears as a thing, the value of which is an intrinsic property rather than a product of the relations of production, the labor which is obscured by the appearance of value, the individual, the bourgeois individual, appears as something that exists apart from, and prior to, its existing relations. The capitalist mode of production not only fetishizes commodities, but produces the individual as a fetish. Species-being no longer appears as something alienated, as something lost to the division of labor, as much as it is exploited, an unpaid excess put to work in the factory. The common essence, and common relations, of species being are exploited, made into part of capital’s profit, more than they are alienated. Or, more accurately, species being is alienated because it is exploited: the more that capital puts to work the combined efforts of the species, the more it appears that capital itself is productive. This thought of the common, which underlies the loss and return of species-being, reaches its culmination with the social individual.Marx’s social individual emerges as a contradictory reality. First, because the social individual is not opposed to the isolated individual, to the bourgeois subject, as a correct or incorrect social ontology, it encompasses it, demonstrating how individuation is itself the product of a particular social relation. As Marx argues the isolated individual is the product of the most developed relations. From this we have at least the provisional definition of capital as not simply the alienation of the human essence, of the species-being dwelling in each individual, but the exploitation of the common, of species being as the collective abilities of mankind. Which is to say that capital cannot simply be identified with the image of the free market economy, with isolated individuals struggling in competition: “Freedom, Equality, and Bentham” maybe the spontaneous philosophy of the sphere of circulation, in which each looks to his own, but the image is inadequate to the hidden abode of production. Such an image overlooks the fundamental cooperative nature of labor, cooperation in the factory, office, or call centers, but also the cooperation that traverses these spaces, putting all of society in relation and association. As Antonio Negri writes regarding the most extreme version of this ideal of isolated individuals, neoliberalism, “The only problem is that extreme liberalization of the economy reveals its opposite, namely that the social and productive environment is not made up of atomized individuals…the real environment is made up of collective individuals.” Moreover, as Marx argued in Capital, the more capital puts to work the collective worker, distributed not just throughout the factory but throughout society, the more it appears that capital itself is productive, that wealth generates wealth. There is a fetishization of capital itself, a fetishization that is in part driven by the fact that species-being, the common, is a relation and thus difficult to perceive, while capital, especially as money and machinery is tangible and real. While the social individual, and its corresponding concept of species-being, provides the contours of a social ontology that would present the common as both a relation of things and a relation of individuals, this ontology is only sketched out in terms of a few early drafts and increasingly isolated references. Marx’s primary goals remain the critical interrogation of the implicit ontology and epistemology and the critique of capital; in other words, his social ontology only appears when it is a matter of critiquing the methodologies of political economy, its ahistorical individualism, or examining the vicissitudes of exploitation in capital. Aside from these two aspects there is the role that this idea of the social individual plays in the political critique, and eventual program, the common in communism, as it were. (Marx’s comments on communism, and how it relates to a new conception of individuality and society, remain few and far between). While Marx’s social ontology provides the necessary conceptual contours for any social ontology (most importantly by showing that the individual cannot simply be opposed to the collective, and that an understanding of social subjectivity necessarily passes through objectivity) it stands as more of a provocation than an actual exposition of such questions. Which is not to diminish the importance of this provocation, Marx demonstrates that the question of the individual and the collective cannot be separated from historical transformations, which is also a matter of saying that it cannot be dissociated from how people perceive their own relation to their society and its forces, in a word, from politics. The dualisms that we have outlined in the beginning, that of the individual and society and subject and object, are not easy to escape. As Marx has demonstrated the individual remains a persistent, and unexamined starting point in Western thought, not just at the level of politics, in the form of various liberalisms, but epistemologically as well, in attempts to reconstruct society from the image of the rational individual. The history of Marxism, with its various attempts to return the individual through its proper place, from alienation to methodological individualism attest to this fact. Perhaps no philosopher has ruthlesslessly interrogated the predominance of the individual in western thought than Gilbert Simondon. Simondon is not concerned with the individual as a political or ideological matter, the methodological individualism underlying social contract theory and rational choice theory, but with the ontological dimension of individuality. The individual in question is no longer the human individual, but the individual organism, or thing; in fact that is precisely Simondon’s point, that philosophy has made individuality coextensive with being: every being is an individual being. What this obscures, according to Simondon, is what is the crucial question as to how things are created and destroyed, the constitution and creation of individuals. In order to properly study this, in order to understand what Simondon calls ontogenesis, it is necessary to dispense with the preeminence that thought attaches to the individual: what exists is always more and less than individual things. For Simondon there are multiple individuations, physical, biological, psychic, and collective, each of which traverses the others constituting its raw material and basis. The individual is neither the end point nor the beginning of this process. Simondon introduces two terms to situate the individual, to make it part of social structures and reality, rather than all of reality. The first is preindividual, or preindividual milieu. The individual, whether physical, biological, or psychic, emerges from a milieu, from a metastable series or relations that can be best designated as preindividual. The elements that constitute the backdrop of the constitution of human individuality, language, affects, and habits are preindividual in that they only exist in a differential state, as a series of relations. Following the previous discussion of Marx, it is possible to think of this preindividual milieu as fleshing out what Marx referred to as its inorganic nature, in each case it is the condition for collective and individual existence. These preindividual conditions are metastable in that they exist as a series of virtual relations: to speak, to adopt a particular style is always to realize a statement from a shifting set of possibilities. What constitutes the basis for individuation exists in a metastable state that can never be resolved: the linguistic practices, affective tonalities, and habits are always in excess of what are actualized at a given moment, in a given language, structure of feeling, or culture. For Simondon individuation is less a state than a continual process. This brings us to the second term, transindividual. While these metastable singularities constitute what exists prior to individuation, transindividual does not so much constitute what comes after, some kind of collective that is greater than the some of its parts, than a necessary corollary of psychic individuation, the individuation that pertains to humans. Transindividuality stems from the fact that individuality itself is never complete, the individual remains a problem: fully complete, fully autonomous individuals would never enter into social relations. Transindividuality is the fact that society cannot exist apart from the individuals that constitute it and vice versa. Individuals are always individuals of a given collective, a given mode of sociality; a mode of sociality is nothing outside of the individuals that constitute it. There is no constitution of an “I” of individuality, without a constitution of a “we” of some kind of collectivity. In order to understand what Simondon’s account of the constitution of the individual offers to the problem of the common it is necessary to understood the relation between the preindividual and the transindividual. This crosses the two difficulties outlined above, that of thinking the relation of the constitution of objects and subjects, and the individual and the collective. If the preindividual constitutes something of a milieu of individuation, the language, habits, perceptions, and concepts, from which the individual is constituted, and the transindividual constitutes the irreducible collective basis and result of subjectivity, then the question arises as to how they are related: or to rephrase the question outside of Simondon’s specific terminology, what is the relationship between the common and collectivity? Simondon’s presentation generally eclipses this relation, presenting the preindividual, individual, and transindividual, along a straight line that makes the first equivalent to nature, and the last spirit, with the individual in between. As Bernard Stiegler, who has drawn on Simondon’s ontology to produce a theory of culture, has argued, it is necessary to think of the trajectory as elliptical, rather than linear. Which is to say that the constitution of collectivity, of transindividuality, continually acts on and transforms the preindividual milieu and vice versa. The preindividual is not just made up of language, habits, and perceptions that exist as a kind of natural backdrop of the formation of subjectivity, rather these things, are themselves the product of a determinate process of transindividuation, a form of culture that in turn is inseparable from its materialization. Or as Stiegler puts it, adding a third term to the formulation of transindividuality: it is not just a matter of the mutual constitution of the “we” and the “I” but that this process must also be situated within a mutual constitution of the “who” (the metastable relation of the we and I) and the “what.” We are individuated not just through our relations with others (that we in turn individuate), but through our relations with things, especially as these things encompass texts, images, and video that communicate with them modes of individuation, modes of subjectification. “All collective belief constitutes itself within a state of supplementarity that conditions collective memory.” This transformation of the commodity into the realm of culture is predicated on the memory and individuation implicit in every commodity: every commodity, every human product, from the flint tool to the iphone, carries with it particular habits and modes of engaging the world. Thus, as with Marx there is no individuation, no subjectification, without a corresponding objectification, without an object that serves as its material basis, and vice versa. This formal similarity is reinforced by Stiegler’s use of the term “proletarianization,” a term that he adopts from Marx only to expand its point of reference: it is not just a matter of the deskilling of the worker in the sphere of production, but the deskilling of the individual in consumption, the things we buy remember for us. Paolo Virno, another philosopher who has tried to think through the relation of Marx and Simondon, has suggested the term fetishism to describe the manner in which an object takes on the attributes of social existence. The fundamental difference between Marx and Stiegler on this point, on fetishization, is that Marx primarily considers the object and subject formally based on the social relations, connecting the form of the commodity, the fetish, with the form of an abstract individuality; Stiegler, on the other hand, considers the object in question not just in terms of its formal characteristics or general relations, but its mode of engaging with memory and subjectivity. Stiegler’s expansion of proletarianization, and his general emphasis on the way in which the commodity generates subjectivity, not just through its formal aspects, but through its way of embodying habits, memories, and perceptions, could be understood as another understanding of the transition from formal to real subsumption, the development of the specifically capitalist mode of production. For Stiegler the fundamental difference is not the social relations that produce the object and subject, commodity fetishism and the isolated individual emerging from the complex and abstract relations, from the separation of the producers from each other, but the social relations that the object itself produces, the difference between the way a tool or object embodies memory and the way a book or movie embodies memory. The latter immediately inscribes my memory within its structure, making it difficult to individuate myself by thinking otherwise, a tendency that increases with the rise of technologies aimed at reorganizing and grabbing attention. As with Marx’s initial concept, it is a matter of a thing, an object, taking on the qualities of social relations, obscuring them as it objectifies them. However, the social relations are not just limited to labor, but encompass the habits and relations of social existence. In Stiegler’s understanding of the intersection of transindividuality and political economy, the commodification of the very conditions of individuation, habit, language, and desires, works against individuation itself, breaking the connection between the “I” and the “we.” The imperatives of commodity production, the demands to create a consumer society, to constantly generate new products and new subjectivity, short circuits these connections, producing a consumer subject that is not a subject at all. Stiegler at times refers to this as a subject who can neither say “we”, unable to identify itself with any transindividual collective other than those who meaninglessly by the same toothpaste or soft-drink, nor say “I”, individuate itself in the face of anonymous and meaningless commodities. However, the commodification of preindividual conditions of relations, the packaging of memories, habits, and desires for the market has as its necessary corollary a production process, a labor process that puts to work not just the physical powers of the body, but the powers of the mind, language, and habits. Thus, Virno follows Stiegler in seeing in real subsumption a deepening of the intersection of transindividuation and production, but he focuses less on the dismal state of the consumer of the conditions of one’s own individuation than on the producer. What the service worker, the designer of interactive web platforms, even the unpaid blogger and anonymous circulator of memes and styles produces is nothing less than the very conditions of individuation, which are the conditions of human existence, or anthropogenesis. Stiegler and Virno can be juxtaposed as pessimist and optimist, but it is perhaps more accurate to see them as focusing on two different spheres of contemporary economic life: Stiegler examines the increasing commodification of the preindividual, while Virno examines the increasing exploitation of the transindividual. Beyond this philosophical division of labor, it is possible to see the intersection of Simondon and Marx raising interesting questions as to the intersection of transindividuality, politics, and economics. The transindividual does not exist apart from the individuals, or individuations, that traverse it: simultaneously constituting it and transforming it. The corollary of this is the idea that the individual is always simultaneously individuated and individuating: constituted and constituting. The question remains, however, as to the precise dynamic of the intersection of these relations; the point where the transformation of the self, individuation, becomes a transformation of the collective, and vice versa. This is the question of politics and of economics, or more broadly it is a question of action, of the various ways in which the common is constituted and transformed. That the common, as species-being or the intersection of preindividual conditions and transindividual relations, functions as both the precondition and effect of individuation, raises the question of action, of the transformation of these conditions. The term “action’ is already something of a misnomer, since it carries with it not just a specific mode of engagement, but the residue of definitions that have set action apart from labor, poeisis from praxis. These definitions are burdened by the distinction that sets work on objects (poeisis) against work on subjects (praxis), the transformation of things apart from the transformation of subjects, economy from culture. These distinctions are called into question by the common, which cuts across these divisions, encompassing material and immaterial conditions. The question remains, however, as to whether or not this idea of abstract activity is, in Deleuze and Guattari’s terms, abstract enough to encompass the common, especially as the common, the transindividual begins to include the beliefs, habits, and memory. Concepts of the common have always put into question the centrality of labor in Marx’s philosophy. As much as the common intersects with labor, as demonstrated by species being, it also exceeds it. This can be seen in multiple instances. At the most basic level the environment as a natural commons calls into question the centrality of labor as the determining factor of value. The same could be said with respect to what could be called the reproductive commons, the labor of care and housework; only with the latter the focus shifts from the common as something given to the common as something produced, as a network of activities necessary to the reproduction of physical and cultural existence but excluded from what generally counts as labor. By the time that we get to the immaterial common, the activities and commodities that constitute the basis for transindividuation, labor itself seems to be in question. It is no longer a matter of counting housework as labor, but of recognizing the way in which attention, communication, and social relations are productive of value and thus a kind of labor. Thus to retain the concept of labor at this point is to change much of what is meant by that concept it is labor without place and without measure. Maurizio Lazzarato has turned to Gabriel Tarde’s idea of psychological economy to produce a model of activity with respect to the common, a model which calls into question the primacy or flexibility of the schema of labor to account for economic (and political activity). For Tarde the psychological economy, is an economy of micro-imitations and habits that exceeds and determines the more restricted economy of commodities and labor. In order for a commodity to be bought, for a thing to be marketed, manufactured, and sold, desires and habits must circulate through relations of invention and imitation. These relations of imitation constitutive of belief and desire take place outside of the factory, in the realm of “the public”. This public, which is nothing other than the relations of imitations and invention that define social relations, constitutes in Tarde’s terms, a kind of collective brain, or mental communism. Tarde’s philosophy makes it possible to extend the intimacy of the common to the point where we can see our private life, our language, habits, and beliefs, as nothing other than solutions to a series of technical, social, and political problems. We are nothing other than individuations, singularizations of the common. This point was already asserted by Marx and Simondon, but Tarde’s particular merit, at least according to Lazzarato, is his focus on habit and imitation as the action by which this process takes place. What is at stake in Tarde’s conception, as read by Lazzarato is a new understanding of action, freed from the paradigm of labor. Action is no longer primarily action on an object, but primarily action on another’s thoughts perceptions, and beliefs. The primary mode of such action is other invention, the creation of a new habit or idea from a see of habits, and imitation, the propagation of a habit. Most importantly for Lazzarato is that it frees labor from a division between mental and manual labor, between the division of head and hand that taints every conception of labor. Against the idea that would locate invention in some privileged site of intellectual labor, Tarde distributes invention across social space, invention or at least the possibility for invention is everywhere. “The cooperation of brains is ontologically prior to its capture.” As Lazzarato argues, Tarde replaces the division between intellectual and manual labor with a division between invention and automation. In the former, memory conditions and transforms the conditions of action, introducing an irreducible gap of indeterminacy between the action and reaction, while in the latter action is a simple reaction determined in large part by the initial action. Mental activities, responses through communication and language, such as making the same pitch at a call center, can be just as repetitive, just as determined as the work of the hand. Moreover, consumption can be just as repetitive as production. The distinction is primarily affective, “In each activity, either material or immaterial, Tarde distinguishes between the joy which is expressed in invention and cooperation, and the sadness which is expressed in work and repetition.” This allows Lazzarato to develop an affective dimension of the commons, one that focuses less on reciprocity, on the equality of access to a shared good, than on activity, the capacity for everyone to become active. The common is not just what everyone shares but it is only common if is shared in such a way that everyone can become active. Lazzarato focuses on money as an object capable of capturing belief, but his reading of Tarde would seem to be equally well suited to examine the way in which desire and belief does not just coalesce around money, as the privileged object of desire and belief, but around the various images, brands, and symbols of consumer society. Virno has suggested that Guy Debord’s concept of the “spectacle” can be utilized to address the images that capture attention and belief. The spectacle is in its most limited sense the product of a specific industry, that of the culture industry which produces images and desires. This particular industry is also universal, not just in the sense that every commodity has its corresponding image or brand, but in the broader sense that these images and desires are not just the stuff of consumption but production, becoming the raw material of future production of images and desires. In this way the spectacle is like money, a particular commodity that is the equivalent of all commodities. “If money is the real abstraction which refers back to finished labor, to labor’s past, according to Debord the spectacle is, instead, the “real abstraction” which portrays labor in itself, the present tense of labor.” Money is the past of labor, as much as it captures desire it does so indirectly, as the means for all future consumption: in contrast to this the spectacle directly acts on desire, defining its objects and goals. To draw Virno’s remarks on the spectacle back in line with Lazzarato’s critique, we could say that what the spectacle operates on is not so much the past, the objectification of dead labor, as the potentiality immanent in the present, the capacity for action. This capacity is defined in part by memory, by the presence of the past, but also by the sense of what possibilities can be actualized; it is what Lazzarato refers to as a world. For Lazzarato capitalism is less a mode of production than a production of worlds. The spectacle is that which draws the border of this world, delimiting what is desired and even imagined. The total value of a commodity is produced by the material labor plus the cognitive labor plus the symbolic value brought by the public. The first is easily described according to the basic coordinates of wage labor and profit. The second is the value of knowledge embodied in design and intellectual property (patents, copyrights, trademarks). The third refers to the value of the brand produced by the attention economy of publics, mass media, and advertisement. It could be argued, following the perspective developed here, that there is not so much a rigid division between these different commons, at each step along the way they are natural and social, comprising everything from the most fundamental aspects of biological existence to the myriad forms of cultural life. Pasquinelli’s remark has the merit of underscoring the fact the various commons are inseparable from their objectification, even reification, into a thing: the commodity, the industrialization of memory, and the brand, are all ways in which the common becomes part of an object, and thus distorted. With the commons there is no “who” without a “what,” no subjectification without an object, but now we can see that this object is often an alienation, something that in representing the common loses it. More importantly, Pasquinelli’s remark underscores there are different forms of labor, and thus different commons, in every commodity, cutting across its material and symbolic aspects. Against a tendency to decide a particular proper version of the commons, either that of the agricultural commons at the margins of development or the information commons at the center of production, a tendency which has as its corollary a corresponding tendency to indentify a new vanguard, the Zapatistas or the immaterial laborer of the multitude, Pasquinelli’s remark underscores the demand to engage with the multiple overlapping commons at work in every production and embodied in every commodity. As much as these commons overlap they also conflict, or come into potential conflict. 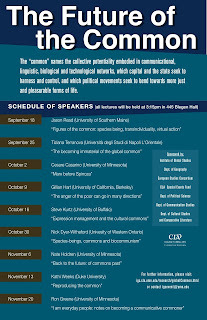 These conflicts follow a pattern in which a particular figure of the common (or different commons) stands in the common as such; for example, the communication and information dense commons of high technology make the other commons appear as so much dead labor, or the immediacy of the agricultural commons directly related to reproduction make the later forms, the commons of habit and language, appear to be hopelessly intertwined with capital. From this antagonism we can begin to see the contour of two thoroughly intertwined political problems. First is that of the visibility of the common itself, the need to make the common appear as labor, as human activity, underlying the various commodities, objects, and activities that in actualizing it also mask it. This entails a reexamination of the old Marxist terms of fetishization, as ways of thinking the relation between an activity and its mode of appearing. This first task, a task which entails the constitution of a new subjectivity, a new collectivity that perceives itself as not only produced by but productive of the common, is inseparable from a second task, that of articulating a relation between different commons, which are not only different aspects of human activity, from the work of the hand to the work of the head, but, in the global division of labor, form the basis of different collectivities and communities. These tasks are political in that as much as their contours can be drawn by the simultaneous problematization of ontology by social relations (and vice versa), it requires forms of practice that cannot be directly deduced from them. Such politics will have to be invented, but it is my assertion that this invention will takes its bearings less from the models and politics from the past, the exhausted language of citizens and state, but from the shifting terrain of the common and its various fetishizations and exploitations outlined here. Michael Hardt, “The Common in Communism” Rethinking Marxism, Volume 22 Number 3 (July 2010) 350. Massimo De Angelis, The Beginning of History: Value Struggles and Global Capital, London: Pluto, 2007, 145. Michael Hardt and Antonio Negri, Commonwealth, Cambridge: Belknap 2009, ix. Etienne Balibar, “Spinoza: from Individuality to Transindividuality,” Mededelingen vanwege het Spinozahuis. Vol. 71. Delft: Eburon. 9. Etienne Balibar, Masses, Classes, Ideas: Studies on Politics and Philosophy Before and After Marx, translated and edited by James Swenson, New York: Routledge, 1994, 222. Karl Marx, Grundrisse. Foundations of the Critique of Political Economy, Trans. Martin Nicolaus,New York: Penguin, 1973, 84 (Translation Modified). Marx suggests a connection between the commodity, as an object, and a particular mode of subjectification in the famous section in Capital on commodification, when he writes: “The religious world is but the reflex of the real world. And for a society based upon the production of commodities, in which the producers in general enter into social relations with one another by treating their products as commodities and values, whereby they reduce their individual private labour to the standard of homogeneous human labour – for such a society, Christianity with its cultus of abstract man, more especially in its bourgeois developments, Protestantism, Deism, &c., is the most fitting form of religion.” Karl Marx, Capital: A Critique of Political Economy, Volume I., Trans. Ben Fowkes, New York: Penguin, 1977, 172. Thomas Keenan, Fables of Responsibility: Aberrations and Predicaments in Ethics and Politics, Stanford, California, Stanford University Press, 1997, 118. Jean-Luc Nancy has developed this idea of “gregarious isolation” which for him is less a matter of a particular socio-historical situation than an unavoidable ontological paradox: that extreme isolation and separation is itself a relation. Jean-Luc Nancy, Being Singular Plural, Trans. Robert Richardson, Stanford: Stanford University, 2000, 63. Karl Marx, The Economic and Philosophical Manuscripts of 1844. Trans. Dirk J. Struik, New York: International, 1964,112. Nick Dyer-Witheford has argued that this trajectory of eclipse and return within Marx’s thought has continued with Marxism. The first return followed the publication of Marx’s texts from 1844 resulting in the centrality of the problem of alienation. Dyer-Witheford argues that we are witnessing a second revival of the concept, a concept that is closely tied with interest in the common. Nick Dyer-Witheford, “1844/2004/2044: The Return of Species-Being” Historical Materialism Volume 12:4. Antonio Negri, The Politics of Subversion: A Manifesto for the Twenty-First Century, trans. James Newell,Oxford: Polity Press, 1989, 206. Marx makes the argument connecting the increasing socialization of production with its fetishization in “Results of the Immediate Process of Production” the posthumously published sixth Chapter of Capital. As Marx writes, “This entire development of the productive forces of socialized labor (in contrast to the more or less isolated labor of individuals), and together with it the uses of science (the general product of social development), in the immediate process of production, takes the form of the productive power of capital.” Marx, Capital,1024. “L’être sujet peur se concevoir comme système plus ou moins parfaitement coherent des trios phases successives de l’être: pré-individuelle, individuée, transindividuelle, correspondant partiellement mais non complètement à ce que designent les concepts de nature, individu, spiritualité.” Gilbert Simondon, L’individuation à la lumière des notions de forme et d’information, Paris, Millon, p310. Bernard Stiegler, Technics and Time, 2: Disorientation, translated by Stephen Barker, Stanford: Stanford University, 2009, 8. “When I inherit an object, a flint cutting tool, for example, I inherit it through it its mode of use, that is, the gestures, the motor behaviors that lead to the production of the flint cutting tool.” Bernard Stiegler, Acting Out, trans.David Barison et al, (Stanford: Stanford University, 2009), 68. Bernard Stiegler, For a New Critique of Political Economy, Transl. Daniel Ross, Cambridge: Polity, 2010) 38. Paolo Virno, A Grammar of the Multitude: For an Analysis of Contemporary Forms of Life. Translated by Isabella Bertoletti et al, New York: Semiotext(e), 2004, 98. Jason Read, “The Production of Subjectivity: From Transindividuality to the Commons,” New Formations (70)120. Maurizio Lazzarato, Puissance de l’invention: La psychologie économique de Gabriel Tarde Contre L’économie politique, Paris: Les empêcheurs de penser en rond, 2002, 135. Maurizio Lazzarato, Les revolutions du capitalisme, Paris: Le Seuil, 2004, 116. Karl Marx, The Economic and Philosophic Manuscripts, 104. Matteo Pasquinelli, Animal Spirits: A Bestiary of the Commons, Rotterdam: NAI publishers, 2008,138.